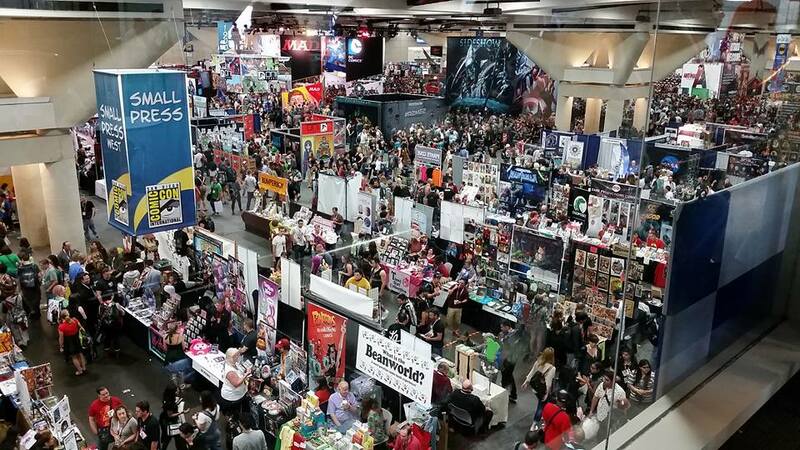 I know this is a bit belated, but I wanted to mention Comic Con, and I hadn’t gotten around to doing it yet. 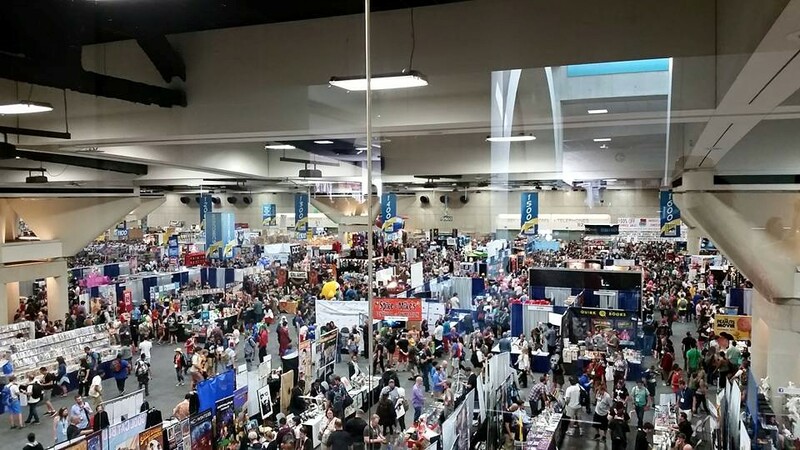 In July I was lucky enough to attend the San Diego Comic-Con. My day began with an author meet-up with Hugh Howey. He brought donuts, there was maybe a dozen of us hanging out, it was an amazing experience. Around the convention center, there were a giant mass of people. There was a great deal of events, showcases, and costumed people outside of the comic con. A person could spend all day just walking around outside. I wasn’t exactly sure what to expect inside. I went in and found a lot of vendors and more people. At first, I was dissapointed. I thought to myself, “this is just a bunch of people selling stuff.” Thankfully, I was quickly proven wrong. They were showing a few exclusive trailers in the main area. It was really cool to gather around and see sneak peeks. Next, I realized that most things were interactive. 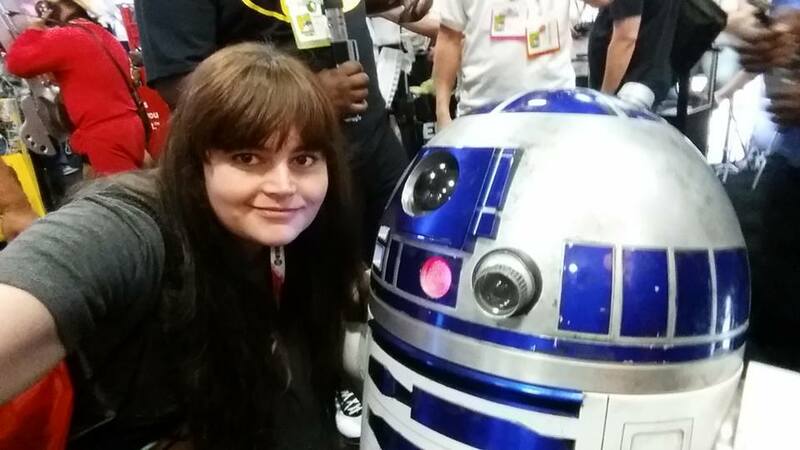 I met R2D2. He was real, remote controlled, and beeped and moved and everything. There was a place to dress up with props and get your picture taken, which I seem to have misplaced that photo, too. They gave away Yoda Ears for dogs. The pair I got was too small to put on my dog, so I gave it to him as a toy. He loved it and it became one of his favorite things to play with for some reason. 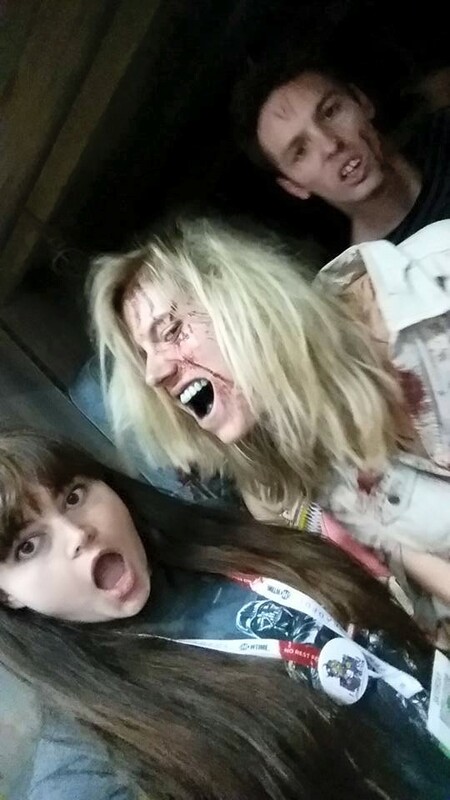 The Walking Dead had a neat, walk-through zombie area. There were lines of people waiting for author signatures and lots of giveaways. There were many more experiences. 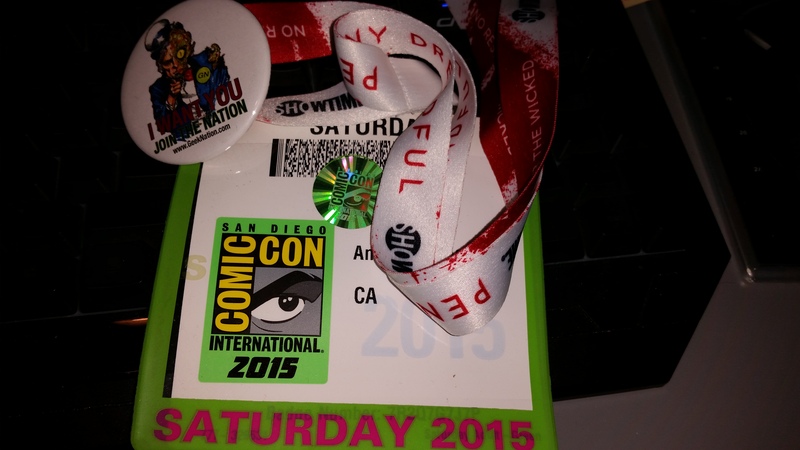 All in all, I was utterly unprepared for Comic-Con. I chose not to attend any of the panels. For one thing, I didn’t want to have to wait outside in the heat for hours just to sit in the back of a room. (Hollywood has spoiled me. If I want to see a panel, I can just hit up the Paley Center, usually for free or $5. I saw a lot of panels there when I first got to Hollywood, American Dad, Awkward, Vampire Diaries, and many more. It’s a fairly intimate space. There are other places and times I’ve seen things like this, too, like LA Book Festival when I saw Scalzi and Wil Wheton have a conversation and I was just a couple rows back. Like I said, spoiled. It’s the same reason big, expensive concerts don’t excite me.) I learned too late that there were smaller talks going on in A hall. Those might have been neat. There were also a lot of other things to do there. There were giant, interactive areas outside of the convention center, but that were still part of Comic-Con. By the time I found them, I was exhausted. I wasn’t prepared for just how much walking there’d be, or how stimulating the day was. I would definitely go back another year. In fact, I’m hoping to go back next year, depending on how life goes. I’m hoping that the Halloween costume I’m making right now will be good enough to wear to it. 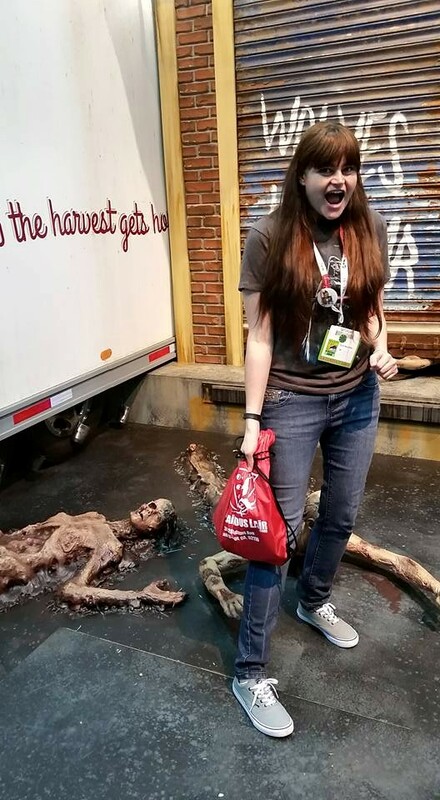 I can’t explain exactly why, but honestly, Comic-Con was one of the best days I’ve ever had. Hugh Howey is one of my favorite writers and has been a great influence on my career. Early last month, I had the opportunity to meet him. A lot of indie authors like to do something called “meet ups”. You see this sometimes on the Kboards or on a particular author’s Facebook page. Sometimes, if you have online author friends, and they happen to be in the area for a book signing, or in Hugh’s case, Comic Con, they might just put out a call for anyone who is around to come and meet them. Hugh even brought donuts. I made the 3 hour drive (should have only been 2, but Comic Con traffic) down to San Diego to meet him. His hotel, where he was hosting the morning meet up, was literally next door to the convention center. Since I was there primarily to see Hugh, I got to park at the hotel and it turned out that it didn’t cost me a thing. I found Hugh and a few other authors and fans sitting at a table in the cafe area near the pool. I was surprised to see that there was only maybe ten people in attendance. Which is ironic when you consider how many people were literally lined up to see him next door. He talked about writing and his process. He talked about how he puts a lot of importance on theme and how, even though the specific ideas that influence his story may not be what’s in the story, it’s what the story is about. I was actually a little surprised to learn what Sand and Wool were really about. It’s been almost 2 months, so I don’t want to paraphrase and mix up his message. But they go a lot deeper than just dystopian scifi. He was very open and invited questions, be them about writing, publishing, or his books in general. He invited those of us who were authors to let everyone there know about our works. I actually managed to speak. More than a couple words. I even jumped into the conversation from time to time and started a couple. I was proud of myself. I messaged Hugh after and thanked him for the meetup. He was nice enough to write back to me and tell me that it was nice to meet me. 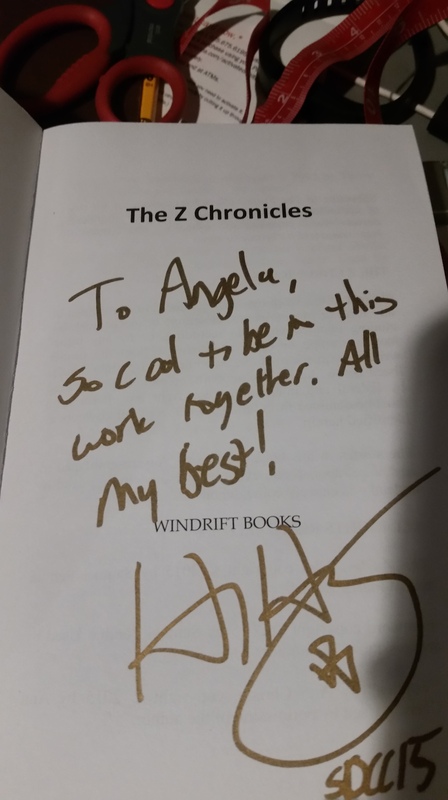 Mention Monday – FUTURE CHRONICLES – Get your favorite or win a pre-loaded Kindle! 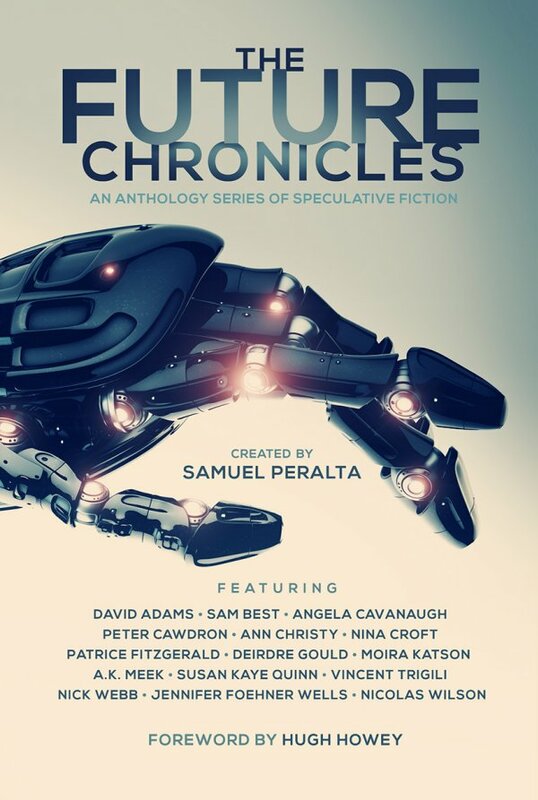 Like the storied SF collections of the past, The Future Chronicles brings you themed anthologies on the topics you love — Robots, Telepaths, Aliens, Artificial Intelligence, Dragons, Zombies… and more. Each collection combines fresh new voices in speculative fiction with established, best-selling, and award-winning authors. An amazing array of talent has joined together to produce a series like no other. 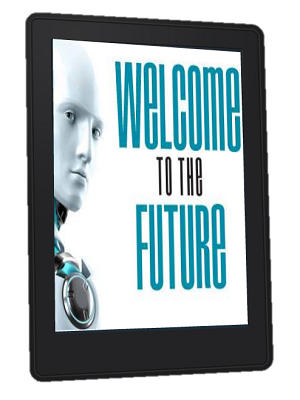 ….A 6″ Kindle Paperwhite with the entire set of currently-available seven Future Chronicles ebooks! August 10-16 is Future Chronicles Week, here with all the authors and contributors of the Chronicles, and there’ll be giveaways from everyone! If you haven’t joined the Chronicles Newsletter yet, now’s the time to join! You’re always able to get Advance Review Copies (ARCs) of forthcoming books, as well as the latest news. And you’ll get the Future Chronicles special edition ebook as our thank you. Or join our Facebook Group, for fascinating SciFi discussions as well as all the latest news on the upcoming Chronicles releases. We are 400+ authors, working together to help create a new Silver Age of Speculative Fiction. 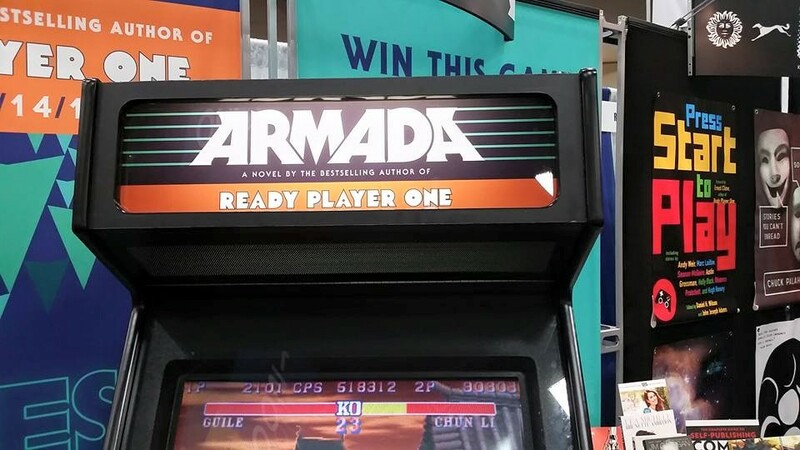 I am a huge fan of Ready Player One. It is easily one of my favorite books of all time. So you can imagine how eagerly I awaited the release of Armada. By now, you’ve probably heard some mixed reviews about this book. Well, you can add this one to that list, because I know I feel a bit mixed myself. I’m excited to be included in another anthology. 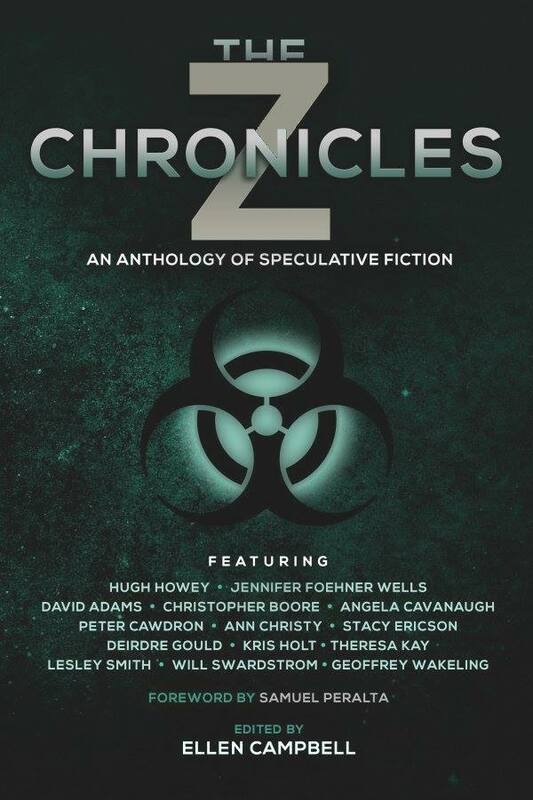 And I’m beyond thrilled to be in one that features Hugh Howey. 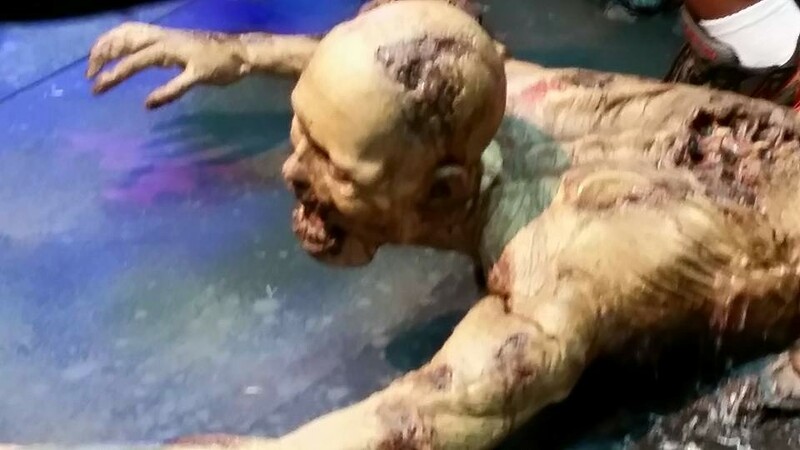 If you like Scifi and/or Zombies, I hope that you’ll join me at the Facebook launch party on Monday, June 15th from 6pm Eastern (3pm Pacific) – 11:30pm Eastern (8:30 Pacific). I’ll be hosting at 10:30 Eastern/7:30 Pacific. Hope to see you there! I also hope that you’ll check out the book. My story is titled: The World After, and is a scifi survival thriller. In a high-tech future where humanity has won and zombies are domesticated, one woman discovers the cost of their way of life as she fights to save her own. You may have seen it plastered all over Facebook, I know that I have, Tor just signed a $3.4 Million dollar, ten year deal with John Scalzi for 13 books. That’s quite a commitment. Some writers are saying that he could have made more with a different deal. Perhaps. He still gets royalties. And, honestly, in the publishing business, you can’t beat that kind of stability. I was just looking at Tor.com and saw that they are currently accepting submissions. Their novella submissions closes in a few days, so I’m not going to make that deadline. But they are also accepting short stories. I happen to have a short story that’s looking for a home, so I’m going to submit. Hopefully they’ll like it. Tor appears to be a great publisher of SciFi, among other things. I’ve heard of Tor before this, but I’m not especially familiar. However, I’m looking forward to learning more about them. A couple weeks ago, I was fortunate enough to go to the 31st Annual Writers of the Future Awards Ceremony. Just like the year before, it was very entertaining and inspiring. Although, about 3/4 of the way through I was ready for it to be over. It gets repetitive and that room was chilly. This year they gave Tom Doherty of Tor a Lifetime Achievement Award. And the Keynotes speaker was William Pomerantz from Virgin Galactic. They also had singers, dancers, aerialists, video presentations… It was really nice to see writing celebrated. This weekend I went to the Los Angeles Festival of Books and was lucky enough to attend a conversation with Wil Wheaton and John Scalzi. It was informative and very entertaining. Wil Wheaton is great to listen to no matter what he’s doing. And John Scalzi is becoming on of my favorite writers. It turns out that Wil Wheaton and John Scalzi have been friends since John Scalzi was first starting out. Their interaction was natural and made the audience feel like we all knew them well. As I’ve mentioned before, I live in Hollywood. Most of the time, it’s just another place. I’ve grown completely used to it and most of the time stay in my apartment. But sometimes, someone will come and visit, and in trying to entertain them, I’ll be reminded of how neat a place Hollywood really is. I’ve had some amazing opportunities here and done things that I know not many people get to do. I’m grateful for that. 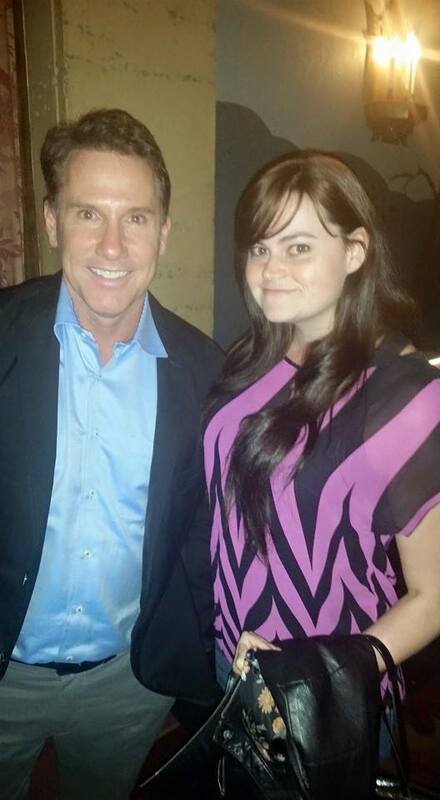 Tonight I met author Nicholas Sparks. 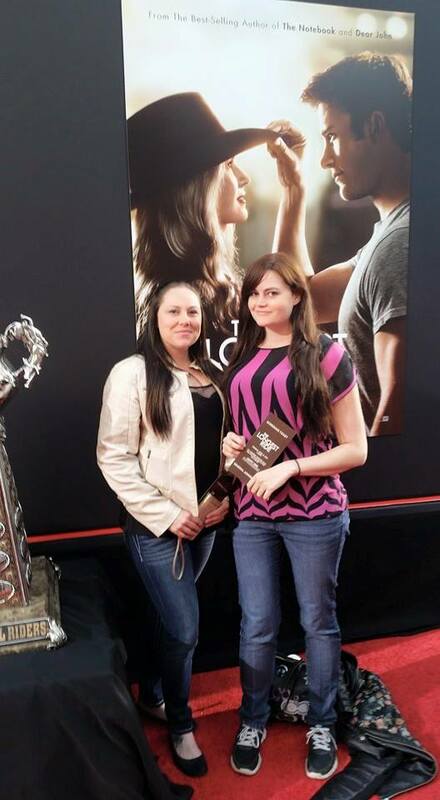 We went to the Premier of The Longest Ride. I love Premiers. 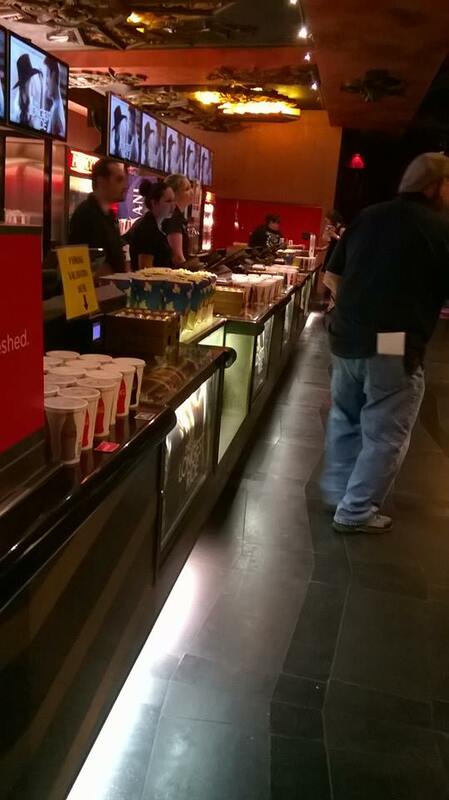 They’re fun, they’re free, they give you snacks (popcorn, candy, soda (which I don’t drink) and water, all complementary). 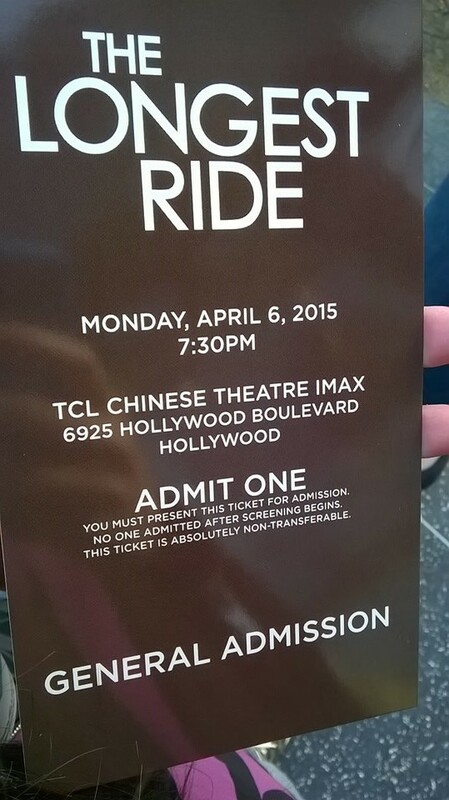 It’s not impossible to go to a premier. I’ve been to close to a dozen. And I haven’t even tried to go in a few years. I’ve mostly gotten over it, because while it’s not impossible, it can take some effort. 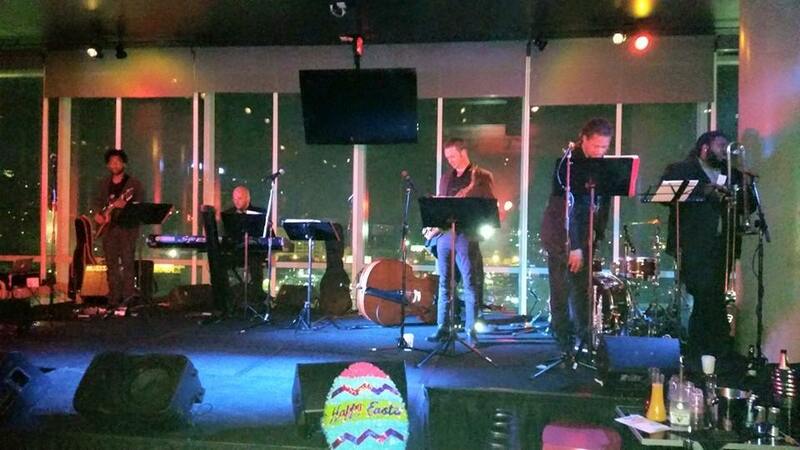 Last night we went to The W Hotel for Jazz Night. It wasn’t exactly what we were expecting. 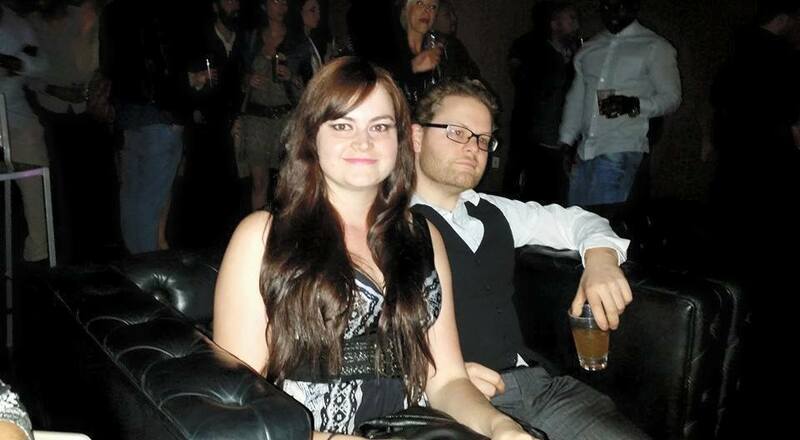 They moved it from the lounge onto the roof, so it was more club-ish then we were looking for. But the live music was good. And they had “Easter Bunny” dancers. It was a fun, albeit, short time. There wasn’t any cover, and we rode the elevator up with Keanu Reeves. But drinks were $14 each, so, yikes there! Only stayed for one. We also went to the fashion district downtown and walked around. Some places were closed, but my mom and sister found some good deals on beads. We ate some BBQ for lunch and I cooked dinner at home that night. Barbacoa. 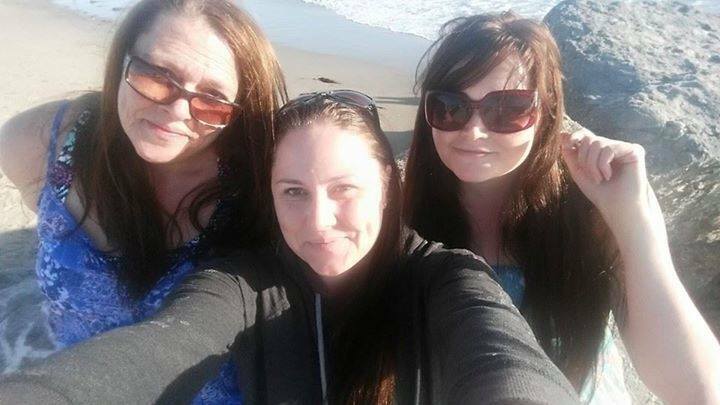 The day before we went to get pedicures and went to the beach. 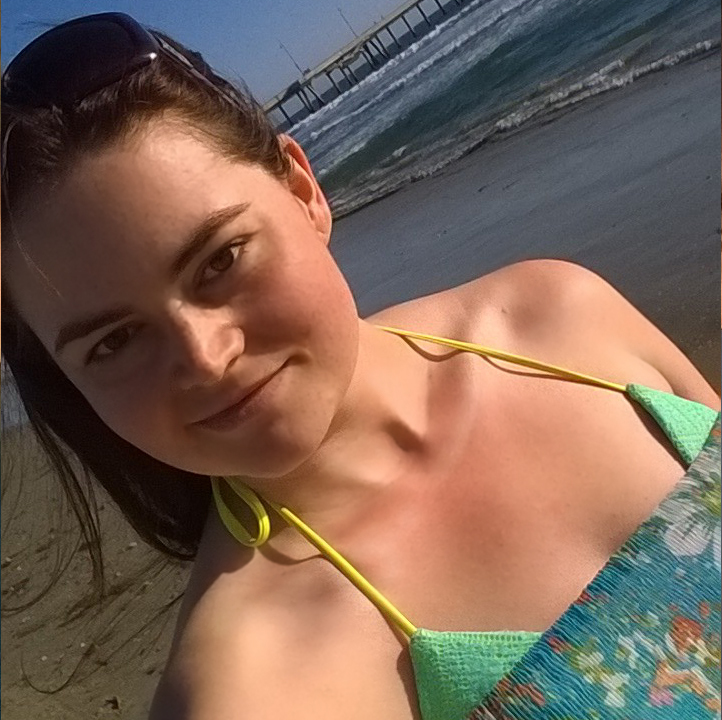 We walked the beach and then the boardwalk on Venice Beach. My goodness, there was so much walking. Lots of traffic, too. But it was a fun time. 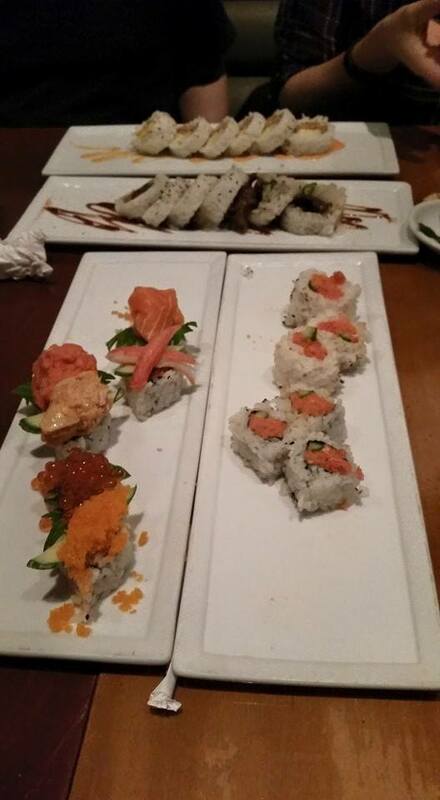 We kicked the whole thing off with sushi and an Improv show. We went to the Upright Citzen’s Brigade. It’s usually good, sometimes great, sometimes not so great. But it’s $0-$10 a show, so it’s hard to beat. It is hard to balance guests, starting a new job (I did that last week), still working the old job, writing, and keeping up with this blog. You’ve probably noticed me struggling. Hopefully life will settle down soon, and I’ll be able to get back into a rhythm. Until then, I’m doing my best.